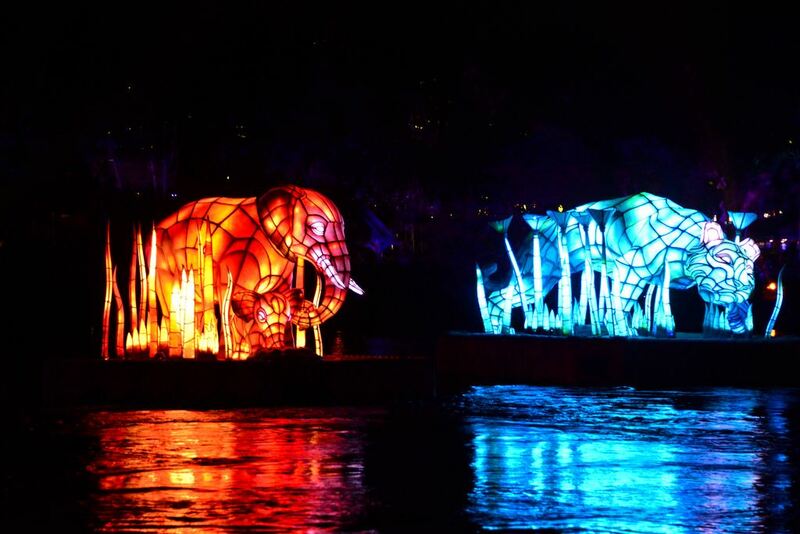 Rivers of Light is the Animal Kingdom’s first nighttime spectacular. 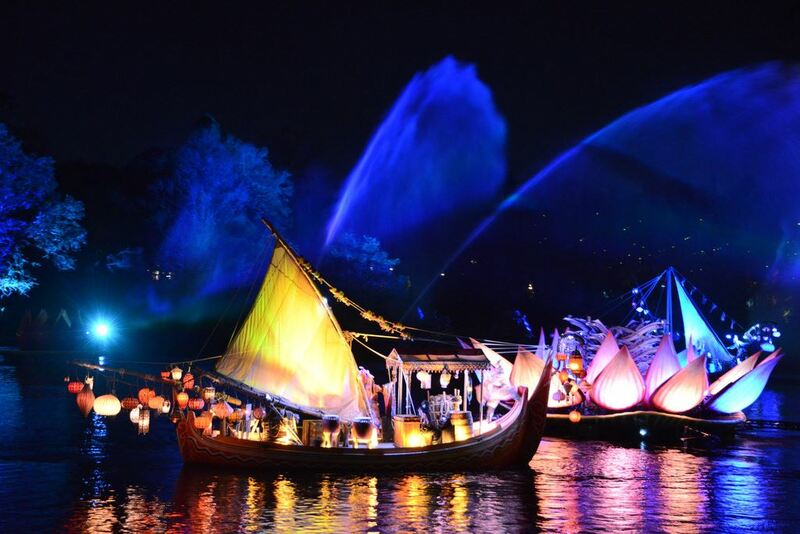 Set on the lagoon surrounded by Asia, DinoLand, and Discovery Island, Rivers of Light uses water screens, fountains, lasers, music, boats, floats, and fire to show the colorful world of animals and nature. 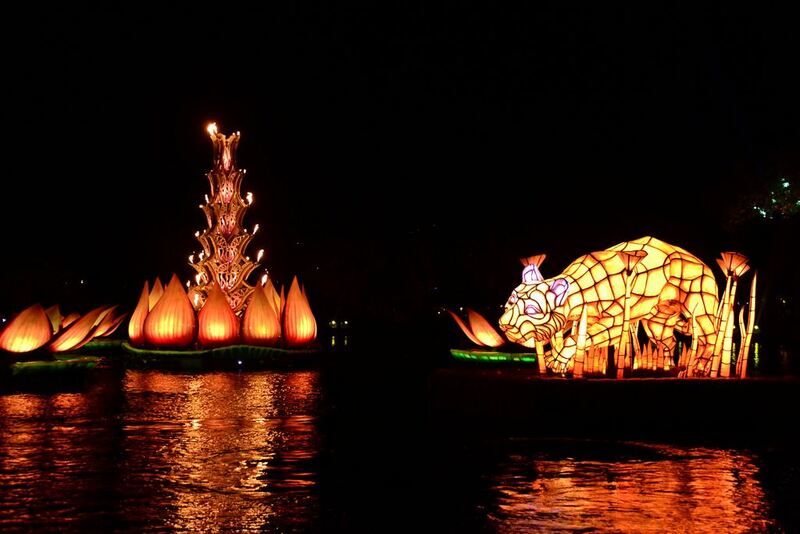 The show begins with four flickering, lotus flower lanterns floating on the lagoon. Unseen shamans conjure the forces of fire and water to reveal the majesty of the natural world, mostly as video projections on a huge water screen projected at the back of the lagoon. The highlight of the show is the appearance of four immense, color-changing floats in the shape of a tiger, turtle, elephant, and owl. 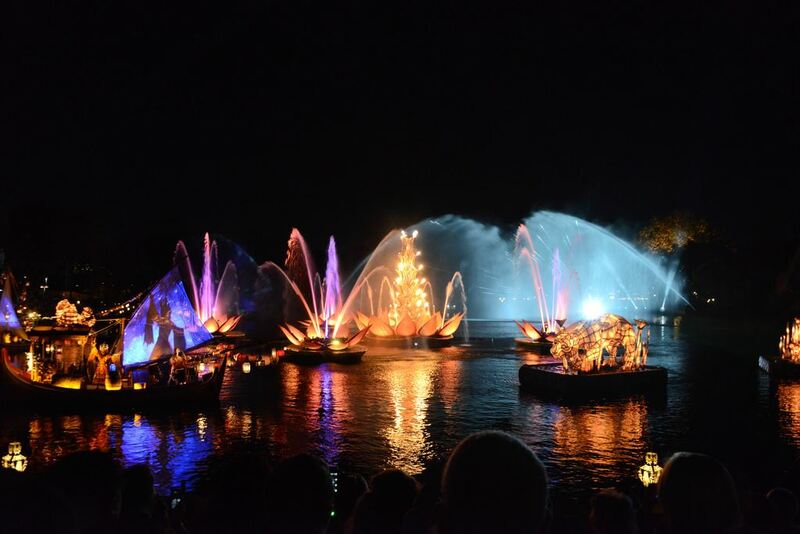 Rivers of Light’s debut was scheduled for April 2016. However, technical issues and (we hear) needed story concept re-writes pushed the show’s opening back by 10 months, to February 2017. Disney solved the technical problems by dropping the non-working elements from the show, and the story problems by cutting out the slower parts. That reduced the show’s running time by almost a third - from around 22 minutes to about 15. Unfortunately, those now-missing show elements were critical parts of many scenes that now appear unclear and dull. 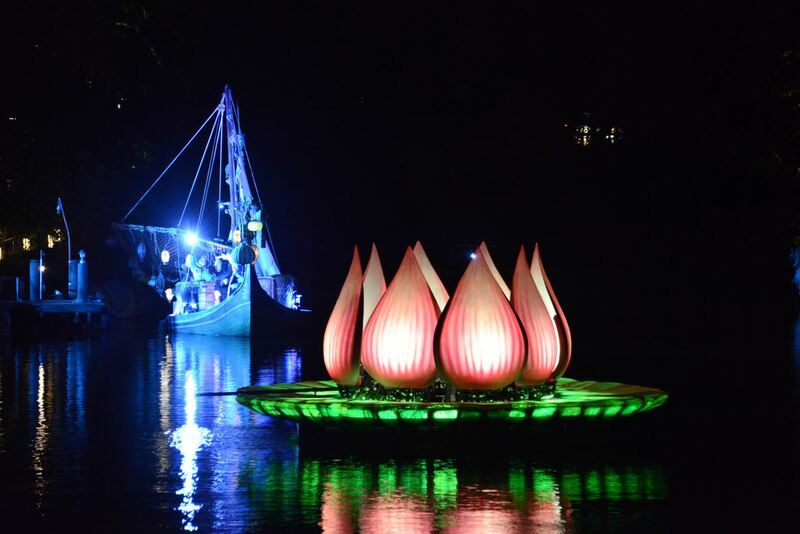 For example, the original Rivers of Light was supposed to include around a hundred small, floating lanterns with independent navigation systems to guide them around the lagoon during the show. These lanterns, we’re told, were going to change color and assemble themselves into different shapes on the water in response to the shaman’s incantations - armadillos, amoebas, and so on. 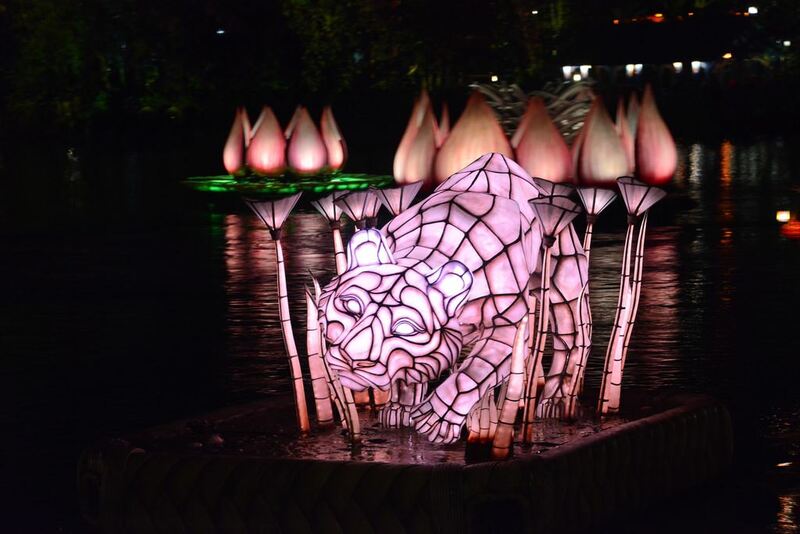 They were an integral part of many Rivers of Light sets. However, Disney was never able to get the lanterns’ guidance systems working properly, so the entire effect was cut. Beyond that, the wind patterns on the lagoon sometimes blur many of the videos projected onto the water screens. Our show notes include snippets such as “Lion? Grizzly? Rhino? Puppy?” when trying to determine what creature was on display. Disney seems to have addressed some of that concern by swapping out photo-realistic images with big shadow puppets and abstract animal shapes, and that’s an improvement. But the remaining images are often fuzzy enough to trigger a mental reminder to visit the eye doctor when you get home. Another concern is the show’s pacing. Because the floats and boats need to move into different positions for each scene, the on-stage transitions are slow, especially for a generation raised on half-second quick-cut videos. It also points out how much Disney’s other parks rely on fireworks to paper over the slower parts of their nighttime shows. 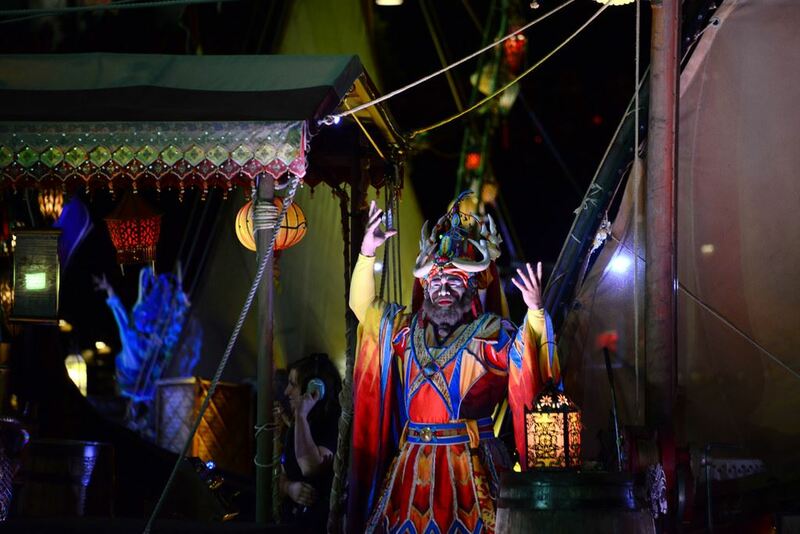 And unlike IllumiNations, Disney’s most ambitious (and longest-running) nighttime storytelling, Rivers of Light relies on too-familiar images and music to be memorable. All that said, we think the show’s use of color, water, and animal imagery will appeal to younger children and anyone wanting something pretty to look at to wrap up a day at the park. Disney’s hoping that’s good enough for now. Rivers of Light is staged in the middle of the Discovery River, with seating split in two sections: on the shores of Asia in front of Expedition Everest, and along the banks of DinoLand U.S.A. in front of Finding Nemo—The Musical. The seats in Asia - half of the show’s 5,000 seats - are reserved for FastPass+. The other half of the seats, on the DinoLand side - are used for those purchasing Rivers of Light dining packages, and for standby guests. There are also very limited, partially obstructed viewing areas around the river. 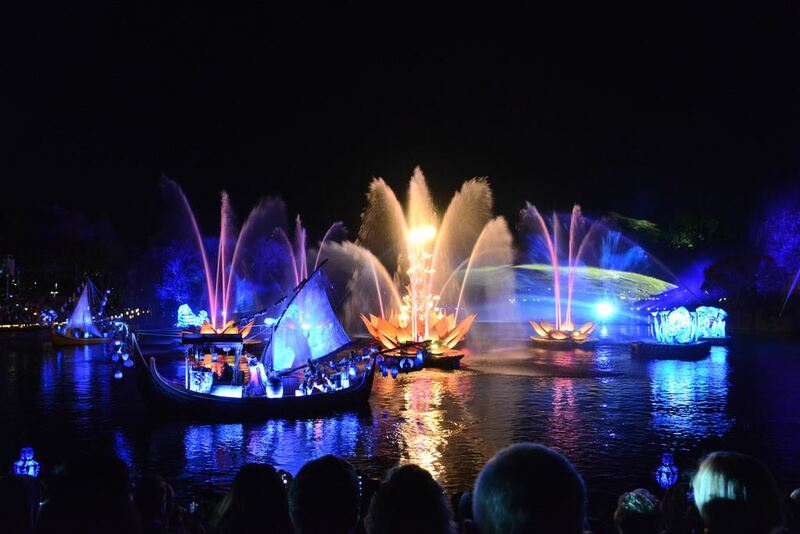 To help meet demand, Disney may run two or three Rivers of Light shows on busy nights, similar to Fantasmic!’s schedule at Hollywood Studios. Still, Rivers of Light has half as many seats as Fantasmic!, but Animal Kingdom draws more guests than the Studios. There may be many nights in which people who want to see the show simply cannot. 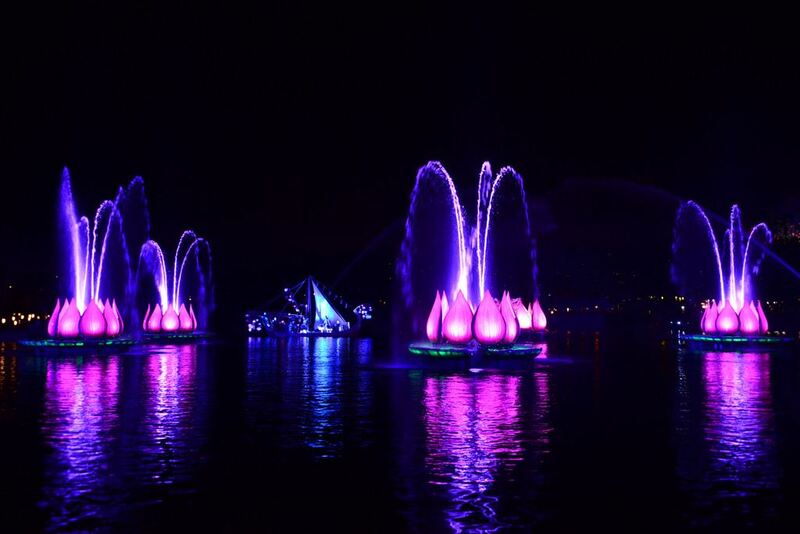 If seeing Rivers of Light is a must, use one of your three advance FastPasses or get the dining package. Finally, the area’s prevailing winds are from the south and east, so mist from the show’s fountains should head away from the seating areas. If the weather forecast calls for winds from the north or west, especially during colder months, bring ponchos or blankets just in case. Rivers of Light dazzles Animal Kingdom visitors with its mix of music, live performers, and elaborate pageantry. What it won’t do, or so Disney hopes, is frighten the animals in the park: For months before the show began, the show’s soundtrack was played in the backstage barns and corrals where the animals bed down for the night. The idea was to familiarize the animals with the show’s sounds, effects, and even audience noise.